This year no well dressed garden should be seen without Festival Burgundy, the perfect bed partner to turquoise, which recently became recognised by the Flowers & Plants Association as the key colour trend for the year ahead. 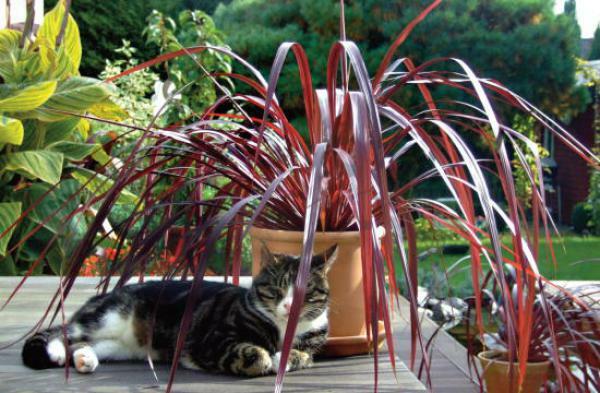 Turquoise, once the toast of the Art Deco movement, contrasts superbly with colours from the opposite end of the spectrum making the deep purple burgundy vibrancy of Festival Grass ideal. Adding a dash of Festival Grass will create the perfect combination of fire and ice to any garden this summer. The Festival Burgundy Cordyline brought to you by worldwide horticultural experts Tesselaar International, has cascading deep burgundy foliage, strap-like leaves and eye-catching, fragrant, pale lilac flowers which help it stand out in any garden and make it the perfect partner for any turquoise inspired presentation. Be bold and be inspired with turquoise this year and let your imagination run wild as you seek the perfect bed partner to create this season’s hot gardening look!